Wow! I’m super excited that I’m going to be able to attend the WKC show in New York City this year. My very besty Leslie Reed of KeelMtn Corgis has her June, AKC Grand Champion / UKC Champion Allegro Celestial Charm entered in the 137 Annual Westminster Kennel Club dog show and has invited me to accompany she and June to THE event of the dog show calendar. I’ve never been to NYC and to attend Westminster is a bucket list item plus I get to go with Leslie. We have talked for years about making the trip without dogs but when the opportunity knocked for this year the door was opened! •The Westminster Kennel Club was established in 1877, making it America’s oldest organization dedicated to the sport of purebred dogs. •Westminster pre-dates the invention of the light bulb and the automobile, the building of the Brooklyn Bridge and the Washington Monument, the invention of basketball and the establishment of the World Series. •Since Westminster held its first show 133 years ago, there have been 25 men elected president and 12 states have joined the Union. The dog show has outlasted three previous versions of Madison Square Garden, and is currently being staged in MSG IV. •The first telecast of Westminster was in 1948, three years before “I Love Lucy” premiered. •In 2005, streaming video with same day coverage of breed judging highlights was made available for the first time on the Westminster web site (www.westminsterkennelclub.org). It was an immediate and huge hit. •A portion of the proceeds from Westminster’s first show in 1877 was donated to the American Society for the Prevention of Cruelty to Animals (ASPCA) to establish a home for stray and disabled animals. •The Empire State Building first honored Westminster by lighting its tower in the Westminster colors of purple and gold in 2004 and will do so again in 2012. •There have been a total of 303,756 dogs entered in Westminsterâ€™s 136 shows through 2012. •Through the 2012 show, there have been 1,713 judges who have officiated at least once at Westminster. One person, Mrs. Ann Rogers Clark, judged 23 times, the highest total. •Two dogs have won Best In Show at both Westminster and Crufts in Birmingham, England, each of them winning at the English show before coming to the America: the Lakeland Terrier, Ch. Stingray of Derryabah (Crufts 1967, WKC 1968) and the Kerry Blue Terrier, Ch. Torums Scarf Michael (Crufts 2000, WKC 2003). •Only one time has the offspring of a Best In Show winner duplicated the feat. In 2000, the English Springer Spaniel Ch. Salilyn N’ Erin’s Shameless repeated the 1993 BIS accomplishment of her sire, Ch. Salilyn’s Condor. •The Papillon, Ch. Loteki Supernatural Being (“Kirby”), is the only dog to capture Best In Show at the World Dog Show (1998 in Helsinki) and Best In Show at Westminster (1999). •In 2009, Ch. Clussexx Three D Grinchy Glee, a Sussex Spaniel, became the oldest dog to capture Best In Show at 10 years, 2 months and 9 days of age in 2009. The youngest winner was the Rough Collie, Laund Loyalty of Bellhaven, who captured the award in 1929 at the age of exactly 9 months. •Westminster was established in 1877, pre-dating the founding of the governing body of the sport, the American Kennel Club, which was established in 1884. •In 1884, The Westminster Kennel Club became the first member of the American Kennel Club. In addition to the history of Westminster, Leslie has made reservations for us at the Hotel Penn (http://www.hotelpenn.com/about-our-hotel.html) the place to stay if you are attending The Garden. 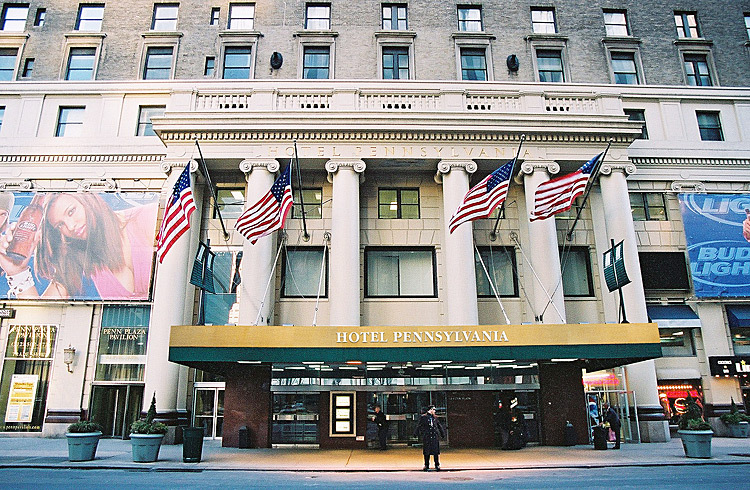 Recognized as the World’s Most Pup-ular Hotel for the Dog Show, New York’s Hotel Pennsylvania is pleased to be the host hotel for all canine hopefuls participating in this annual event. In fact, the hotel has earned the 2012 ‘Pet-Friendly Hotel of the Year’ award for its pet-friendly services. I can’t wait for our adventure! Go Team June! Lucky you! Sounds like a lot of fun! We’ll DVR that one for sure and cheer June on!